Focusing on a region of the Alps where farming has been a mainstay for millennia, this book examines a successful grassroots movement to ban pesticides. The town of Mals, located in a semiautonomous region between Austria and Italy, may reasonably be called an agrarian paradise. 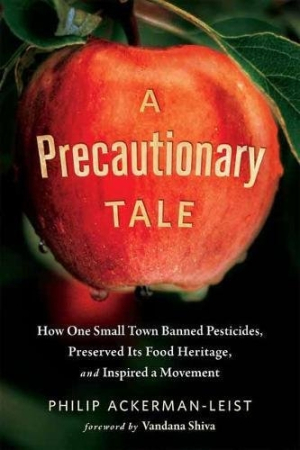 However, an influx of apple orchard monocultures threatened the residents and their organic crops with airborne pesticides. Citizens and local government unite in this real-life David-and-Goliath tale that focuses heavily on community and tradition. Ackerman-Leist clearly takes joy in the book’s subject. Lively prose brings out the best in the independent-minded and quirky Malsers, whose farming practices, homes, and political activism shine through the pages. The author paints a vivid picture of the southern Tirolean region. Its plight is omnipresent in the book, and the frustration of Malser farmers is as moving as the creativity and dedication of its activists. This book could easily inspire both travel plans and community action in a single sitting. However, though it does a good job illustrating the lives of the Malsers, the book often deviates so seriously from its thesis as to get lost. A detailed chapter about Otzi the Ice Man has tangential relevance but ultimately distracts; the lives of the Malsers can sometimes become too detailed for the pacing of the book. Only in its second half, after several chapters that conclude with hints and dramatic buildup, does the book begin to coalesce around the main drama. A Precautionary Tale is an optimistic read with an enthusiastic and celebratory tone. Activists will find it inspiring, and community leaders in a position to take the example of Mals may see in it a blueprint for peaceful, calm, and productive civil discussion around the environment.